The upcoming new year will be a "special one" because this will see an entry into adulthood and voting age of all those who were born in the year that began the21st century, Prime Minister Narendra Modi said on Sunday. "Tomorrow (Monday) will be a special day. Those who were born in the year beginning the 21st century will turn 18 and will become eligible to cast their votes," Modi said during his monthly and 2017's last 'Mann Ki Baat' radio address. The Prime Minister appealed to all those turning 18 in 2018 to register themselves as voters and help frame the "India of 21st century". "Your vote will become the foundation of a new India... You will not just be granting yourselves the right to vote but will be making yourselves the founders of the tomorrow's India," Modi said. He also suggested a district-level organising of 'Mock Parliament' sessions to give the young adults a practical knowledge of the polity. He exhorted the youth to use their voting right to usher in a "people's revolution" for the country's development. #Mannkibaat sparked a great deal of commentary all over the year, including a tweet from cricket legend Sachin Tendulkar that went viral. 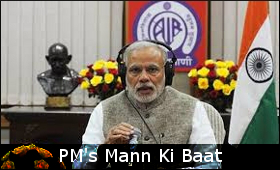 "Mann Ki Baat" is a radio programme hosted by Modi on the last Sunday of every month to addresses people of the nation on All India Radio, DD National and DD News. "#MumbaiRains and #TripleTalaq emerged as some of the top trending hashtags of the year," Twitter said. Jallikattu, a traditional Tamilian bull-taming sport, was in the spotlight earlier in 2017. Other trending hashtags were #Demonetisation, #SwachhBharat, #UttarPradesh, #GujaratElections and #Aadhaar.